Measure: *Easy to use. Good Accuracy. 1 year warranty. For advanced model, see CHC102A. Rapid detection of human body temperature passing through. Stopping is not necessary. 1. Instantly synchronized display of the thermal imager like the picture on the PC screen . 2. When the thermal imager to detect more than a high temperature : with two different warning sound, you can set the body fever warning sound and warning sound outside fever over the body ( such as hot coffee and hot food ... etc) . 3. Flashingred warning, digital temperature display characters , a warning sound from the PC speaker . 4. Thermal imaging screen is automatically saved every minute as JPG files according to date for the file name . 1. Using a high -resolution 160x120 Uncooled VOx microbolometer sensor . 2. High sensitivity 0.1 ° C.
3. Host lightweight and easy to carry can be fixed or portable. 4. Host with LCD screen , simple operation and can be used alone independently, weight 300g. 5. Includes a temperature warning is displayed and set temperature range. 6. Definable abnormal temperature and color temperature table styles. 7. Includes the highest temperature automatically track display. Equipped with emissivity , distance, humidity and ambient temperature correction . ... And many other features . 6. 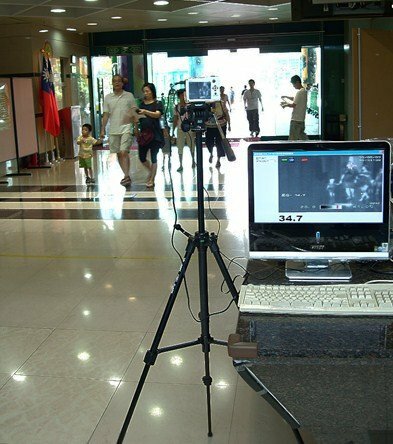 Temperature distance spatial resolution : can detect 0.31cm hotspot 1m distance. 2. The immediate area is displayed the first non-contact thermometer the temperature of the screen containing the maximum temperature value. 4. When the temperature alarm condition occurs, an alarm can be synchronized PC speaker sound . 5. When the temperature alarm condition occurs, the PC screen is displayed by the red warning flashes. 6. When the temperature alarm condition occurs, immediately in accordance with the time to record your records. (1) SD card 1GB one . (2) AC power transformer one .